Moonkin Journeys: Thank You Bloggers! I'm pretty much in the same boat as many bloggers have already spoken of. The one where, "I read so many great blogs, I fear leaving someone out if I attempt to specifically thank everyone." I can attest to the reality of truth in that statement. None-the-less, Amerence set forth a terrific Blog Azeroth Thanksgiving Event, which I whole-heartedly embrace for all it's "warmth and giving.". I've been reading World of Warcraft blogs, probably near five years now.(?) Silently soaking in all the game knowledge from the theorycrafters, class specialists, long time gamers in general. The story writers, the humorous out-takes and cartoonists. Coupled with everyone's personal thoughts along the way on just about anything to do with the game, and even the game mixed with real life. There's the independant writers, team and guild writers, and even those who try to keep track of all the blogs available within the warcraft blog community. The list is rather abundant and bountiful, to say the least. Although the list is rather large, I am truly thankful for all the creative, inspiring and captivating bloggers in the community. Over all my years of game time you've (albeit, without knowledge) helped me progress in game with your tips, stratagies and how-to's. You've laid the ground-work for me to become a reasonably successful player on many different characters. You've kept my spirits up when the game was going sour and pixil deaths were many. Your encouragement and support did not pass by unseen. Thank You! I am also thankful for all the "fun" blogs, as I call them. I've come to know bloggers through their game art, cartoons and quite humorous "raid" graphs. This highly creative atmosphere extended to even more blogs as authors were writing stories with and about warcraft characters. Such wonderful stories which always had me looking for their continuing sagas and adventures each night. You've brightened many a night for me with your art and writings. Thank You! Some say that all good things must come to an end, and to some extent I suppose there is truth to that, unfortunately. The WoW blogging community has certainly seen some great authors close their blog doors. I've seen a few of these passings, always with a certain amount of sadness within. I've read of others by way of bloggers who knew of them, and there was a sadness over what I missed without knowing. This is kind of a calm sadness though. It is out-weighed by the feelings of being thankful for the time I was able to enjoy thier writings. However long or short that time was, they were treasures I remember well. They came, they blogged, and left their mark. Thank You! One semi-dark day way back when, the sun poked through the clouds and cast sparkles of dancing light on the tail end of some misty rain drops. I stumbled into this World of Warcraft community of bloggers, pitched a tent and made a home of it. I'm very thankful for that day. For through their blogs, I've come to know some really amazing people by way of their writings, their art, and their very special way of "giving." To each and every one, "Thank You!" Sol, I love the photo montage! Okay Ironsally really loves it because she's in it, you know how she is. I know, I am so thankful for this event, I have found even more blogs that will hopefully stay around until they too are old favorites. Say Hi! to all the kids for me! omg! I made it on the photo college! O_O Thank you! ^_^ Good luck on your entry! I am honoured and more than a little surprised to see myself in your collage. I'm sad to say that I've just discovered your blog now (nice theme, BTW. I feel right at home), but I'll be visiting often, I'm sure. We are honored and privileged that our writings, musings, and other postings would "brightened many a night for you." 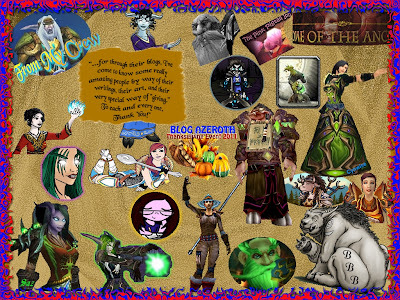 There are so many writers and people in the blogging community as you know over at Blog Azeroth. I second what Fannon repeated, do you have a Twitter account? We use it often and chat back and forth on various things. I just wandered around your postings for this month and saw you are also participating in #IntPiPoMo without knowing it ahead of time. Twitter is a great way to give a shout out for others to stop by and check out what you got going on. Keep up the great writing and please join us in the daily community banter on Twitter. There was recently a menacing attack of Turkeys against one of us... lets just say hilarity ensued. "Thank you!, everyone for your wonderful comments, and Welcome to MJ. @ Ancient: Ironsally has certainly inpressed and inspired all the kids with her couragous adventures. Whenever she makes an appearance, Sol gets to dust off his groupie "crowd control" abilities. lol. Anyway, we are certainly thankful for having found your *blog home*. @ Mia: You are very welcome! Hmmmm, sometimes you just never know who's been reading those posts, and what impressions they've made. :) Yep, I'm one of the silent ones, but I'm thankful for the visits I've made to your *blog home*. @ Fannon: lol, I'm sure that there are probably a few surprised bloggers up there! It hasn't been all that long since my mold cracked and I started to actually make comments on many blogs I've been reading for so long. And I'm sad to say, that there is no Twitter account here. I'd probably never get the hang of using such a new-fangled technical thing, LOL. One never knows though. Some day I might venture into that brave new world of tweeting. After all, I've braved many new worlds in Azeroth. Thank you Effy, I really enjoyed putting it together. And thanks for coming by, I'm glad you enjoyed your visit! That is a fantastic creative collage! Love it! I love the "fun" blogs. While I appreciate the serious theorycrafty reads from time to time (mostly when a new patch is on the horizon or has just come out, and I need to get my toons up to speed), it's the fun blogs that keep me involved in the blogosphere week in and week out. There are so many really good blogs in the community and I enjoyed attempting to piece together the collage. When it came time to post, I was still wishing I had time to include even more wonderful authors. :) <3 to all! Hmm, judging by the comments here, the tale of the turkey raid on my citadel has broiled itself into the stuffing that legendary meals are made of! You have no idea how much of a grinning fool I am right now. Seeing my character mixed in there with that wonderful collection of bloggers just...I don't know man, but I must say that I am beyond honored. Thank you, Saz! And you are very welcome. I really enjoy all your posts at "World of Saz", it's such a fun and interesting place to visit. LOL, thanks for the warning on Twitter. I'm still reading all the various how-to's around the net. A rather surprising amount of them. Vidyala, you're very welcome! I'm glad you got a chance to see and enjoy the collage. Hope you're enjoying the new DMF!